Universal USB interface for CAN, CAN FD and LIN - MACH SYSTEMS s.r.o. 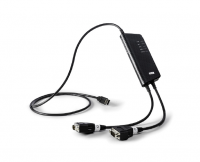 Kvaser Hybrid 2xCAN/LIN is an universal USB interface with two CAN/LIN channels. Each channel can be configured as either CAN or LIN and switching between those networks is done just by software. Channels are independent and each one is galvanically isolated. The CAN FD (both ISO and non-ISO) is also supported. With Kvaser Hybrid 2xCAN/LIN, the user has many ways of usage since he decides whether he needs two CAN channels or two LIN channels or their combination. This interface is an interesting tool mainly for the automotive industry where CAN, CAN FD and LIN networks are often used together. The interface is fully compatible with Kvaser drivers, which can be downloaded for free, as well as with Kvaser SDK for CAN and LIN, which is also provided for free and contains examples in many programming languages – C, C++, C#, Delphi, Java, Python, and Visual Basic. The interface is already supported by X-Analyser, a software for monitoring and simulation of CAN and LIN communication. It has always been difficult for companies that worked with both CAN and LIN networks. The solution was to buy an interface with one CAN and one LIN channels, which was expensive, or to purchase separated interfaces, one for CAN and the other for LIN, which is both expensive and clumsy. Kvaser Hybrid 2xCAN/LIN is a solution in terms of price as well as practical use. It is cheaper than both previous solutions and thanks to the flexible way of configuring the channels, it suits a large number of use cases.